Discussion in 'Olympus' started by tomspielman, Mar 26, 2019. Does anyone know if the XA-2 takes the focus zone setting into consideration when choosing shutter speed and aperture? So let's say the zone is set to closeup, would it be more likely to choose a larger aperture than if were set to the middle setting or mountain? I bought a couple of XAs and an XA-2 from someone looking to get rid of them. I'm fixing them up but will only keep one, - probably an XA. Right now I'm running a roll of test film through the XA-2 and can see why some people might prefer it. Still leaning towards an XA but want to have a more complete understanding of what the XA-2 does before I decide for sure. Thanks for posting the link. Unfortunately the manual was pretty light on details about the auto exposure but I'm probably over thinking it anyways. The camera is meant to be simple to use and the focus control is probably just the focus control. I had an XA2. I highly doubt it did anything as sophisticated as what you are suggesting. I'm sure you're right. I was just wondering. In lower light levels it would have to make some sort of trade off between risking a shutter speed that's too slow vs a depth of field that's too narrow. If it took focus position into account that might help it choose, - but I suppose it can never know for sure what the photographer intends. Seems like a good reason to keep the XA instead. I don't think the XA-2 would change the shutter speed depending on the focus distance. Many people prefer the XA-2 because they don't like the XA rangefinder. However, with a good XA the rangefinder works well. Many used XA's have faded rangefinder patch and make it difficult to use. For me the XA is much better because I like the rangefinder plus the ability to choose the aperture. I agree. The XA is much more capable. The only advantage an XA 2 has is that you can pretty much pull it out of your pocket and shoot and you'll get a useable image. The XA can sort of do that if you've left it set at the hyperfocal distance and maybe 5.6 or 8 for an aperture. It is possible to improve the rangefinder of an old XA if you're willing to pull the top off and clean the viewfinder/rangefinder lenses and mirror. It's hard to get at everything but the results have been good for me. I had the XA I bought in 79 and that one never gave me problem with the rangefinder but I sold it in 84. I bought 3 used XA and only one has a good rangefinder. You're talking about f/5.6 or f/8 and the XA-2 can't do that. It's always at f/3.5 and thus setting the right focusing range is important. The XA-2 doesn't have a fixed aperture. It goes from 3.5 - to 14 from the specs I've seen. 14 is kind of a weird number, but so is 75, - the max shutter speed. One advantage the XA-2 does have in addition to a faster shutter is only an advantage in certain situations. Last night I was taking pictures at an outdoor event and I only had one hand free to operate the camera. So I set the focus of my XA based on distance but found that it moved too easily, - without my intending to move it. The XA-2's focus setting isn't going to budge very easily unless it's on portrait or mountain and you close the dust cover. Then it always moves to the middle or group setting. Opinion on these has always been divided: depending on your primary use, one will be a better fit than the other. Many feel the XA is too clever by half and overshoots the mark: more a collectible curiosity than truly useful pocket documentary camera. Just as many feel the XA2 is junkier than the XA, despite being more optimized for purpose. I'm somewhere in the middle: having owned both, the fading rangefinder and flare-magnet f/2.8 of the original XA drove me nuts, I liked having control over aperture and focus until I realized these features (for me) defeated the purpose of an idiot-proof, always-ready pocket cam. When prices got stupid high on the XA during a collector wave many years back, I sold it and replaced it with the dirt cheap XA2. The slower lens and program exposure of the XA2 led to more shake issues, but overall fewer missed shots because I could just pull it out and press the button. The XA2 never achieved as good a result as the XA when that camera was set perfectly for a given shot, but since I never bothered to use the XA that way the advantage was moot. Today the average cell phone camera replaces both, especially the XA2: paying for mediocre film results seems pointless, when the phone will do that for free. If I'm gonna do film now, I grab something more vintage to play with like Olympus RC or Voigtlander Vito B. But before phones came along, nothing could beat the XA cams for always-on-you photo potential. Here's a trick I used on the original XA. With ISO 64 film I would set the camera to its maximum ISO (800?). Then it would always use 1/500 of a second no matter the F stop set. This effectively converted the camera to full manual exposure control. I have an RC along with a couple of medium format cameras, an OM-1n and an OM-2S. If I'm looking for a really high quality film photo, I'll use a medium format camera. If I want to shoot film and need some lens options, I'll go with the OM-1. The problem with the RC is that in terms of picture quality it's no better than the OM, it's not as versatile, and it's not that much more compact. I'll probably sell it. That's why I've been experimenting with an XA/XA-2. I want a film camera I can just pull out of my pocket. Phones are fine but I actually find them to be kind of pain to take pictures with from an ergonomic standpoint, though the results are plenty good and you don't worry about lighting and having the right film for the conditions. I have a compact digital camera that's got some really nice features but it's not quite pocketable. As far as the expense of film goes, I have a pretty good stock of film. A lot of it is expired but for my purposes the results are fine. I have also got a supply of B&W chemicals that will last me awhile. If I want high quality color, then I've got to fork out for some chemicals because they only last about 6 months and are only good for so many rolls, but a kit is about $30 so it's not that expensive. If I want a camera to relinquish controls to I would much rather have the Nikon 35Ti than the Olympus XA's. So when I want to XA it's the XA that I want. Like all the old gear we mull over, suitability for an individual photographer of any specific item depends first on its performance condition, then any other factors. Some of the original XA had great f/2.8 lenses, others flared so badly they were near hopeless: the samples I've used were the latter. If you can make that lens work for you, and don't mind the fiddly manual controls, its a super pocket cam. Personally, I got more utility from the f/3.5 XA-2, because the lens flared less, and it could be used like a 110 Instamatic. Yank it out of pocket, slide it open, and snap. No thought whatsoever given to depth of field or artistic exposure: I wanted to record something, quickly, period. If I was going out with any intent toward controlling exposure or focus, I carried a Rollei 35S or an old vintage folder (or ye olde Nikon F2 or Oly OM-1). 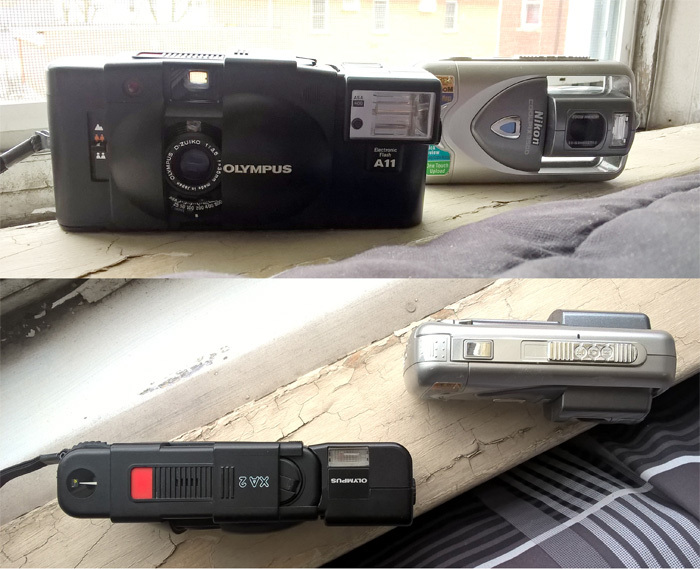 This thread prompted me to go thru my sock drawers and check if I even still had my XA2: I found it right next to another forgotten relic, my once-trusty Nikon Coolpix 3500 that had replaced it (before phone cameras eclipsed it in turn). The XA2 is tinier than I remembered: even with flash attached its barely wider (yet still lighter and less thick) than the Coolpix. Popped a battery in, and the XA2 still works perfect after 10 years sitting. I should run a roll of XP2 thru it next weekend for old times sake. I did end up selling the XA-2 and time will tell if that was the right choice for me or not. What I've found though is that even the ones sold for parts tend to work. Typically it's just a wonky shutter button that's easy to fix and some leaky light seals that are cheap to replace. So if I want another XA 2 I can find one. The next step in my camera clearance is selling the RC. Very nice camera. I love the film advance, - but I don't have much occasion to use it. I'd be curious to see how your pictures turn out orsetto.